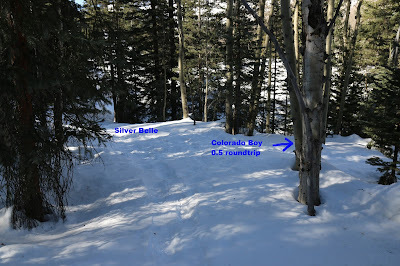 South Pipeline is in the Ironton Park Nordic Trails system south of Ouray, Colorado. The trail begins at the end of the Silver Belle trail where it follows an old slurry tailings pipeline that ran from the Idarado Mine to a tailings pond in Ironton Park. The deep chasm of Corkscrew Gulch had to be spanned by the pipeline consequentially splitting it into what today are known as the South Pipeline and North Pipeline trails. 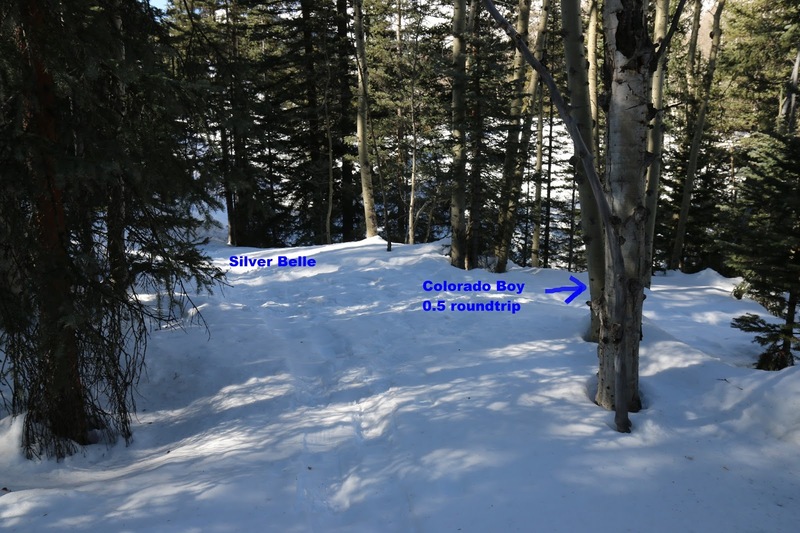 Follow the directions for the Silver Belle trail to get from the Ironton Park trailhead to where the South Pipeline trail begins. 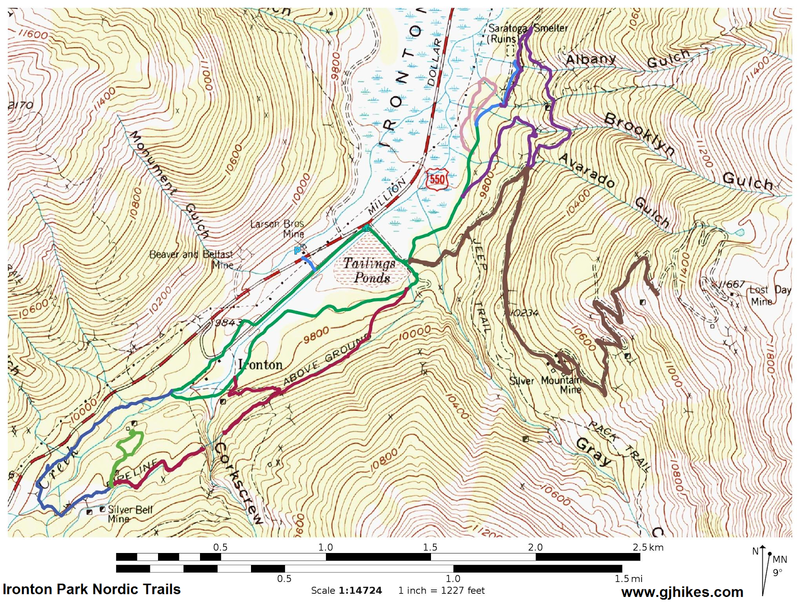 The one-way distance from the trailhead is about 1.8 miles. The trail starts out by gaining about 50 feet of elevation as it eases its way up the side of the mountain. After the initial climb the trail levels off for the remainder of the distance. Tall stands of pine and aspen trees shelter the trail from the winds that occasionally get channeled over Red Mountain Pass. 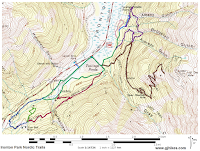 Much of the trail resembles a wide swath that makes route finding a cinch. The trail comes to an abrupt end when it reaches Corkscrew Gulch. At the time that this slurry pipe bridge was constructed it was the longest suspension bridge in the State of Colorado. From here you can get a glimpse of the narrow confines of Corkscrew Gulch. Beyond the mouth of Corkscrew Gulch the high valley of Ironton Park stretches itself out between Red Mountain Pass the the Uncompahgre River Gorge. Ironton Park is surrounded by high alpine ridges some of which tower above 13,000 feet. Views of the surrounding peaks are at a premium though as the thickly wooded forest blocks most distant scenes. South Pipeline is a short trail with enough stunning scenery to well pay anyone that takes on the little bit of added effort that it requires. Most of the work is already done once you make your way up the Silver Belle trail to get to this point. If you would like to see it for yourself then all you have to do is grab your skis or snowshoes and 'Take a hike'.